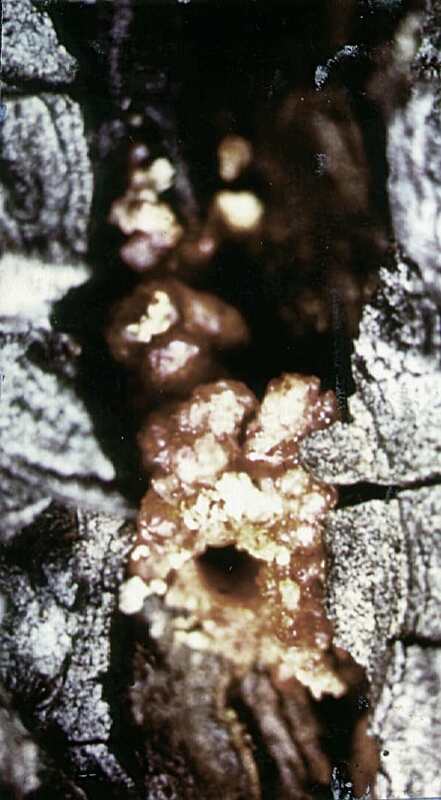 The Larvae are small, creamy white, segmented; feed out through inner bark in mass formation, producing a cavity from a few square inches to more than a square foot between the bark and wood; cavities filled with resinous fluid. While the adults body are stout, 1/4-3/8 in. long, head is broad and without a frontal groove. Red turpentine beetle (D. valens) or black turpentine beetle (D. terebrans). They both attack bases of healthy, dying, injured, or felled trees and stumps. Egg galleries are Irregular, longitudinal, a few inches to several feet long, packed with frass in which eggs are laid. Most all pines are susceptible and occasionally fir, larch, and spruce. While the Black Turpentine Beetles are found to be in the Southeastern United States along the Atlantic coast. Drought, low vigor, overcrowding, injuries and nutrient deficiencies contribute to attacks. Easily noticed are the pitch tube on base of stem, crumbling resinous frass on ground at root crown; reddening of individual branches. There are one or more generations per year. Heaviest attacks in mid-summer; overwinter as larvae and adults in trees and stumps attacked previous season. In southern range, all stages present any season of the year. Adults occur within pupal cells constructed in the boring dust of the brood chamber or in short mines along its margin.